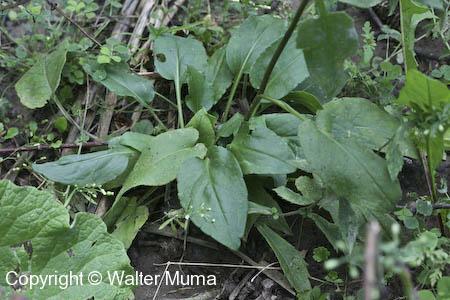 Distinctive features: Leaves are sort of arrow-shaped, without a deep cleft at base. Branches sweep upward, close to main stem. 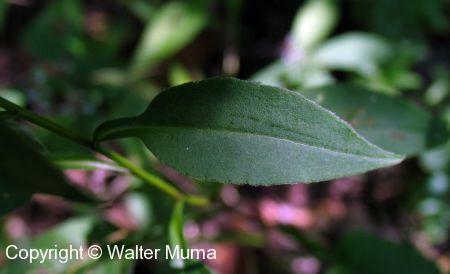  Heart-leaved Aster (Symphyotrichum cordifolium) - Leaves larger and more heart-shaped. 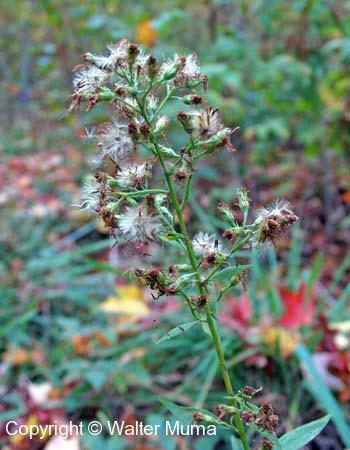  Calico Aster (Symphyotrichum lateriflorum) - Same habitat, smaller plant, horizontal branches, smaller leaves. 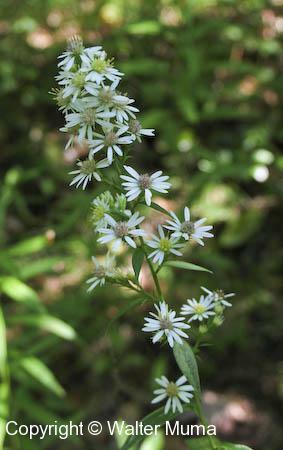  Large-leaved Aster (Eurybia macrophylla) - In the woods; flower head is flat-topped; leaves are much larger. Flowers: Summer, Autumn; White; 7 or more parts (petals); 1.5cm in diameter. Ray flowers: 8-15, usually white, sometimes pale pink or bluish. Disc flowers: 8-20, yellow becoming purple. Flower heads are a panicle shape. Many flowers are arrayed along upward sweeping branches. Leaves: Alternate, Simple; Sparse, arrow-shaped, but in the form of a spear point, not the form of -> or <-. Narrowly egg-shaped and shallowly toothed. 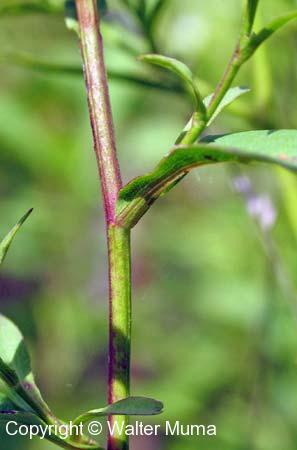 Leaf stalks (petioles) winged. Lower leaves may be somewhat heart-shaped. 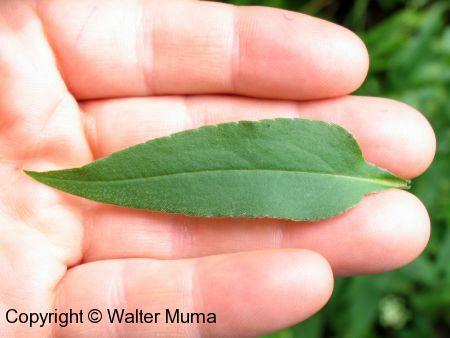 Lower leaves are the largest. Stem: Smooth to somewhat hairy. Side branches are upward sweeping. Habitat: Fields and Open Areas, Meadows; Forest edges or dry open areas of woods. Widely distributed in southern Ontario. 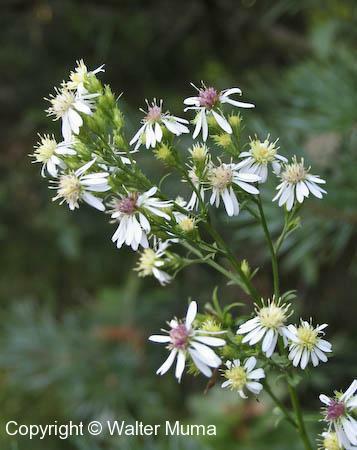 Notes: This Aster grows on the edges of forests. It is most easily confused with Heart-leaved Aster (Symphyotrichum cordifolium), which often grows very near or in the same area. 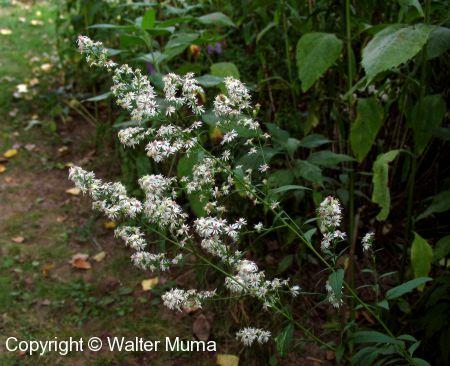 It can also be confused with Calico Aster (Symphyotrichum lateriflorum) by the novice. Photographs: 155 photographs available, of which 18 are featured on this page. SCROLL DOWN FOR PHOTOGRAPHS. 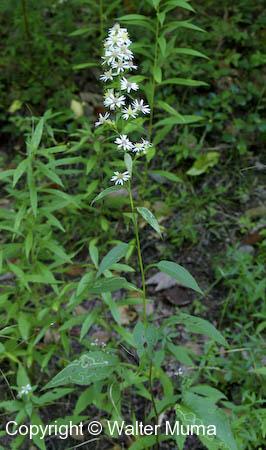 Typical Arrow-leaved Aster with upswept stems and white flowers. Note the branches that sweep up and remain close to the plant. 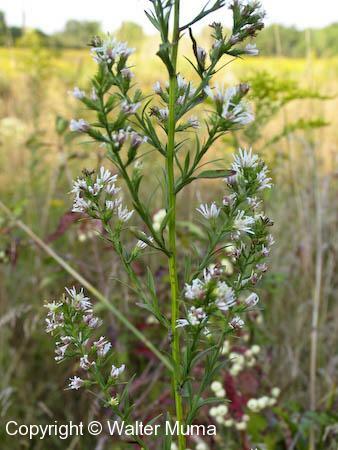 This is in contrast to Calico Aster (Symphyotrichum lateriflorum), with which Arrow-leaved Aster is sometimes confused. A closer look at the flowers. Note they are typical Aster flowers in that the discs start out yellow, gradually turning purple as they age. A closer view of flowers. A plant with smaller upswept stems. 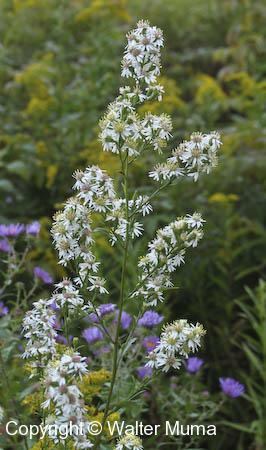 Arrow-leaved Asters like to grow at the edge of woods and fields. The leaves which give this plant its name. Note that the "arrow" aspect is an arrow without a very deep cleft at the base of the arrowhead (in the world of botany that cleft is referred to as a "sinus"). The underside of the leaf. 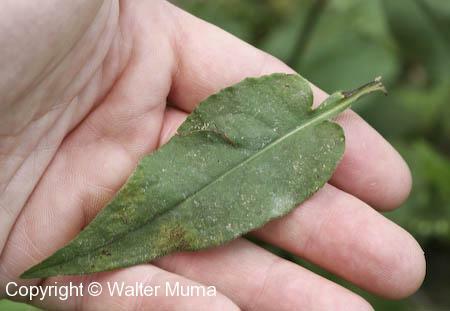 A leaf attached to the plant. A worn leaf, in September. 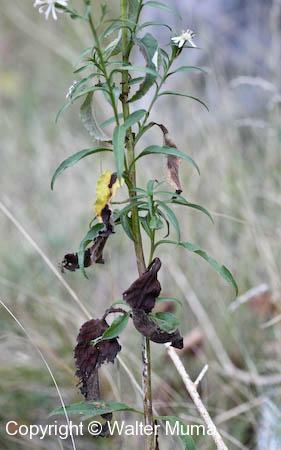 The lower leaves are usually dried up by the time this plant is flowering. 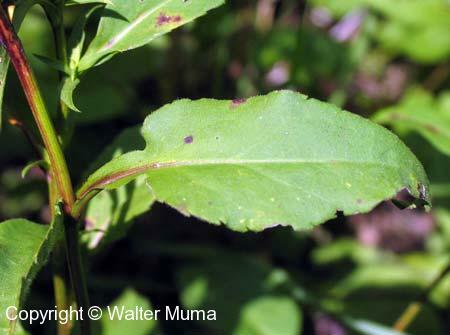 The upper stem has many smaller, non-arrow-shaped leaves, sort of like Heart-leaved Aster (Symphyotrichum cordifolium). Going to seed in early October.